​​Many treatment programmes will start using the pool and then move onto the underwater treadmill. However, some dogs will start treatment on the underwater treadmill, depending on injury, weight, age, fitness and how long post-surgery. For some, they may only use the underwater treadmill. The treatment programme is not set in stone, we have a very flexible approach based on our assessment of your dog. The Premium Physio-Tech Underwater Treadmill gives us the opportunity to treat any size of dog from a Newfoundland down to a Teacup Chihuahua. The entire treadmill belt can be raised safely to any height to allow the dog to be treated with ease and comfort. They can be closer to us and you while we treat them, this is so much better for your dog and for you to be involved as the session progresses. The treadmill belt can be moved slowly into an incline position, the water level can be adjusted and the speed changed, all this can be done safely while we are treating your dog. No other Underwater Treadmill gives as many treatment options. Also, the entire width of the treadmill is the ramp to get the dogs in and out, it is very wide and has an extremely shallow incline for easy and safe entry and exit. Our pool is 3.0 metres x 2.0 metres and is partially set below ground level for easier access. It is approximately 1.2 metres deep and has 2 anti-swim jets, an Underwater Viewing Window in the side of the pool and an Underwater Light. It is heated to a minimum temperature of 28 degrees Celsius. The quality of the water in our pool is extremely important to us. The pool has a sand filtration system, heating system and UV filter, which are checked daily. We test the water quality in the pool at least 3 times per day and record the chemical and pH balance. Access to the pool is via a ramp with a non-slip surface and another gentle ramp down into the water, which your dog will be carefully guided down into the water by us. This also offers a really good resting place for your dog between swims. All dogs are fitted with a correctly sized buoyancy aid, which we use on all dogs for their first swim. This will help with their confidence and give extra support whilst in the water, even if they are just swimming for fun. They will continue to wear a buoyancy aid until they are strong enough and confident enough to swim with a harness. Why the Pool or Underwater Treadmill? One of the main differences is that the pool allows for completely weight bearing exercise whereas the Underwater Treadmill encourages partial weight bearing exercise. This makes the pool more suitable for dogs who suffer with multiple limb arthritis to allow the feeling of weightlessness as well as increased pressure onto the joints for pain relief and reduction of swelling. It can also encourage improved elbow and shoulder range of motion as well as greater extension from the hip joint and improved cardio vascular fitness. 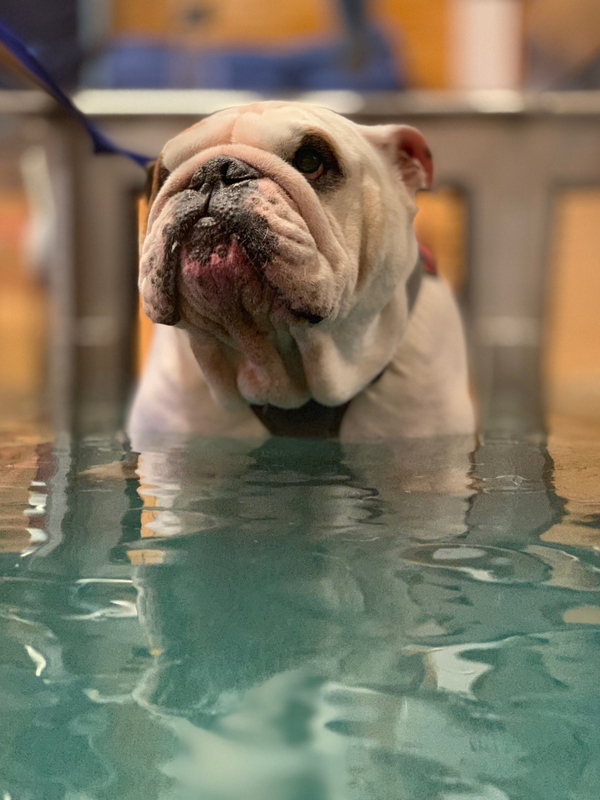 The Underwater Treadmill enables the therapist to have greater control over the patient’s movement as well as exertion levels as we can control the depth of water and speed that the dog walks. This means we can target the ROM of particular limbs or joints and alter this as the session progresses. It is also a fantastic tool for gait analysis to evaluate the dog’s movements to highlight aspects of their gait that may be less evident on land. It is always determined by your hydrotherapist in which particular piece of equipment your dog will be most suited. This can depend on a great deal of factors such as lameness, handling ability, fitness, breed, hydrophobia, pre or post-surgery and most importantly what it is that we want to achieve from that patient’s rehabilitation. Some dogs are more suited to one than the other and some may experience both pieces of equipment if the aims within their therapy plan change over time. We have a video camera set up to film your dog’s Hydrotherapy session through the window in the side of the pool, with a live feed to a TV screen. This gives you the chance to see exactly how your dog’s limbs are moving underwater. We will record certain sessions to use for ‘movement analysis’ at full speed and slow motion so that we can really see if your dog is improving their range of movement. This also helps us to plan the next treatment sessions to really get the best out of each session for your dog. Small video clips will be used as part of our feedback to your veterinary surgeon along with our written report to them. We are the only Canine Hydrotherapy Centre in Kent and Sussex that have this great facility. If a dog is unable to walk up the ramp to the pool due to their condition or injury, we have an incredible hoist system that can gently lift and move your dog safely around the centre, into the pool and Underwater Treadmill if required. Using the hoist system can be particularly useful for dogs that have a spinal injuries or that are extremely nervous getting in or out of the pool. We are also able to use it for dogs that cannot fully support their own body weight when we need to use the Underwater Treadmill to allow us the opportunity to re-educate the dog’s gait. When we use the hoist the dog is supported in a specifically designed harness for lifting dogs safely. We have a walk in shower area. We will shower your dog before and after treatment/swimming in our pool. Your dog will then be toweled and blow dried. It is very important that your dog is dry and kept warm after treatment.